When the clutch begins to wear prematurely on the Mini Cooper, drivers are faced with a pricey dilemma. Unfortunately, this problem impacts at least 10 different Mini year models with the average mileage being 24,000. Since clutch issues impact the performance and overall reliability of your vehicle, it is important to recognize not only the symptoms, but also the unhealthy behavior that could lead to premature wear. What is the Clutch’s Function? The clutch is an important part of your vehicle’s power. By working with the transmission, the clutch works to engage and disengage specific parts. When the driver shifts gears, the clutch communicates with the transmission, engine, and steering to ensure that enough power is given to support the action. Because this part plays an important role in your car’s function, it is imperative to keep a keen eye on how your car is performing. Sudden jolts, smoky engines, or delays with shifting gears are all examples of clutch malfunctions. 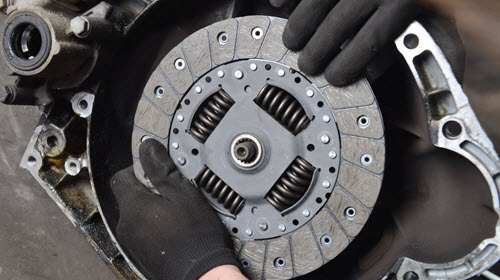 In order to keep your clutch healthy for as long as possible, it is important to avoid treating your clutch poorly. Below are some things that can cause damage to your clutch. Shifting can be a tricky task, especially if it is done quickly or early. When a driver changes gears or shifts prior to making sure the clutch is disengaged, this can result in pretty serious damage. In addition, performing your shifts too quickly can cause the springs to experience possible failure. This is partly due to the combination of heat, inconsistencies and pressure being placed on this delicate area of the car. One way to avoid this is to make sure you are shifting gears after the clutch is disengaged. This will make for a smoother transition without the threat of internal damage. Rollback occurs when your vehicle is trying to develop enough power to endure a tall hill or catch up with the breaks. You will notice your car rolling backwards, which can result in fear or panic on the driver’s part. Some drivers use their clutch as a means to brake the car as opposed to relying on the brake function. While this may seem like a convenient trick, it is actually causing damage to your clutch. So much so, it can create serious wear and tear on your vehicle. The best way to avoid this damage is to use your emergency brake when rollback occurs. This will keep the clutch engaged without prompting the car to move incorrectly. Believe it or not, everyday wear and tear that occurs within the vehicles interior can create lasting damage. When oil, dirt, or other forms of debris contaminate the clutch, it makes it difficult for the clutch to operate correctly. Fluids like grease, oil, or leaks from the main seal are usually the triggers for impacting the clutch. Although burnouts may be fun and tempting to try in a Mini, this move can cause serious damage to your clutch. When done on a regular basis, it can even create permanent damage to other parts of your vehicle. While it may be awesome to test the limits of your car’s performance, it isn’t fun dishing out thousands of dollars to replace your clutch. Play it safe and avoid the burnout! While driving your car, it is important to avoid actions like riding the clutch or forcing power. In addition, every car’s clutch is a little bit different, and you know your car better than anyone else. Therefore, keep lending your car to friends at a minimum. This will cut down the risk of possible damage done to your Mini. The fantastic specialists of Import Motorworx have been serving the people of Lawndale, Culver City, West Los Angeles, and South Bay, CA for nearly 8 years. Specializing in European parts, we know how to take care of your vehicle. We make scheduling appointments easy with our online database and friendly customer service representatives. By giving you clear and concise information, we are able to provide you with dealership quality service at a reasonable price. If you are experiencing issues with your Mini, schedule your personal consultation today!